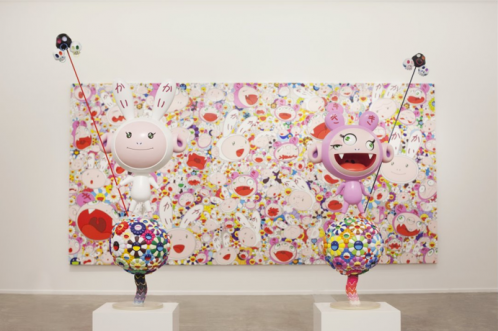 Takashi Murakami, one of the world’s best-selling artists, the same artist whose controversial masturbating manga sculpture, My Lonesome Cowboy sold for £9.5million in May 2008, is now showing his most diverse show in one of the Gulf’s strictest Muslim countries. The meticulously crafted exhibition Murakami – Ego plunges the viewer into Takashi’s mind, providing a rare opportunity to explore a wide range of works including his iconic ‘superflat’ paintings and sculptures. 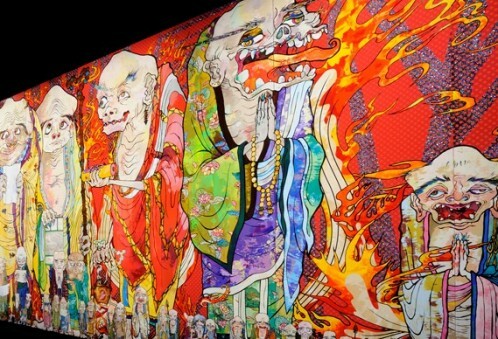 However, the work that steals the show isn’t the circus tent in the main hall or even the giant inflatable sculpture of the artist, but the 100-metre painting.The representation of Japanese suffering following the March 2011 disaster was created especially for the show. It depicts the human being’s ego when faced with nature. The painting acts as a reminder of the limitations of our condition as human beings.